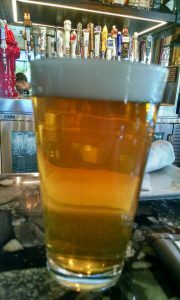 Visited the Lazy Dog in Downtown Summerlin and enjoyed their Honey Blonde Ale. The pour on this ale was fantastic with a head that captured all the sweet aromas and laced the glass nicely on the way down. Like the name suggests, the smell was sweet with a scent of honey. A nice malt taste was the first flavor that led to a very light hoppy finish. This was a very crisp and refreshing brew with a soft mouthfeel that paired well with the Ahi Poke Jar that I ordered. A thank you to Jake the bar manager for the suggestion of adding sriracha and soy sauce to the ahi. If you find your way to The Lazy Dog make sure to have Brandon pour you a cold house brew. Try their Pale Ale, Hefeweizen or Stout and let me know what you think.